With 2015 now done and committed to the memory books, we're into “Oscar hopefuls and weird throwaways” season, although January has started to show some weird, idiosyncratic life of its own in terms of new releases. One of the more challenging and strongest awards contenders goes wide this weekend, and in what is proving to be a more unpredictable than usual Oscar race, box office could tell part of the final tale. Alejandro González Iñárritu's followup to last year's Best Picture winning Birdman might just be taking home another Oscar itself this year. 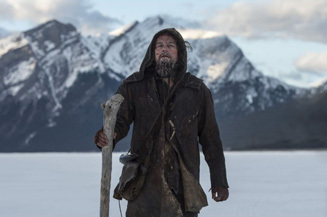 The Revenant stars Leonardo DiCaprio in the true-ish story of a fur trader in the 1800s west, left for dead after a bear attack and forced to journey across a hostile wilderness. Hazards (I mean, beyond the bear) include the elements and Native Americans as well as those who left him behind and killed his young son. Filmed mostly in daunting fish-eye vision with a ton of Iñárritu's trademark long takes and first-person perspective, it's a paranoid, alienating fever dream of a movie that filled with gore and guts to boot – which is what makes it all the more surprising that it looks geared to be a hit. A lot of this comes down to its star. DiCaprio has had a rather spectacular run of late, with only 2011's tonally odd and bizarrely make-uped J. Edgar as a blotch on his resume. Otherwise, he's taken films like The Great Gatsby, Inception, The Wolf of Wall Street and even Shutter Island to great heights. Working with great directors has generally paid off for him (*coughcough*Eastwood*cough*), and grabbing the most recent Best Director winner seems like par for DiCaprio's course, who is apparently learning from the best in marketability, like Tom Cruise. In addition to DiCaprio, the survival story narrative is a good one if played right to audiences, and the marketing campaign has indeed not only not shied away from the intensity of the film, but embraced it. It's similar in the way to how Quentin Tarantino's films have been marketed of late, and as movie audiences seek out unique big screen experiences as opposed to just going to the movies, it's a valuable one. Combining this with DiCaprio's considerable star power and a strong supporting cast (including Tom Hardy and Domhnall Gleeson, late of Star Wars), this should be in line to build mightily on its over $100,000 per venue average last weekend to a wide release figure of about $31 million.